March 1, 2016 0 comments on "How to Make Chicken Caesar Salad in a Jar"
If you get on Pinterest very much, then you have probably seen a photo of a Salad in a Jar. I was skeptical at first, I mean, it looks and sounds kind of weird! When I saw a recipe for Chicken Caesar Salad in Jar, I decided to finally give it a try (who doesn’t like Chicken Caesar Salad!?). It’s my favorite salad. The idea behind a salad in a jar is that you can make salads up ahead of time and put them in the refrigerator to have for lunch during the week. Everything you need is already in the jar, making it an easy, convenient lunch on the go. To make salads in a jar, you will need some pint sized canning jars. If you like to can, then this is a great way to re-use canning jar lids that you would otherwise throw away. You can make just about any kind of salad in a jar. The important thing to remember is that you need to layer the ingredients in a certain order, with the salad dressing first, and the lettuce last. If the lettuce and dressing make contact with each other in the jar, your lettuce will get soggy, and no one likes soggy lettuce! All your other ingredients will go in between. The general rule is to layer salad dressing, chopped vegetables, chopped meat, cheese, and then lettuce. If you are making chicken caesar salad, then put the caesar dressing on the bottom, and then chicken, then parmesan cheese, then romaine lettuce. When you are packing the jars, pack the ingredients in as tightly as possible. After you put in the dressing, vegetables, etc., then pack it the rest of the way full with lettuce, making sure that none of the lettuce is touching the dressing. If you are adding croutons, then you will need to take them along in a ziploc bag, don’t put them in the jar or they will get soggy. Place the lid on the jar and store in the refrigerator up to 5 days. Enjoy! 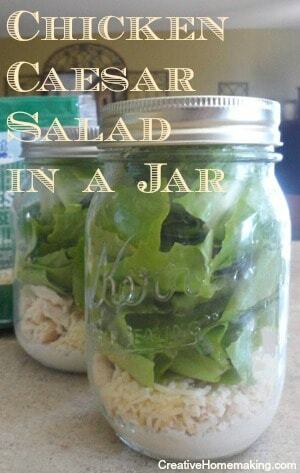 Try this salad in a jar with homemade Caesar salad dressing.